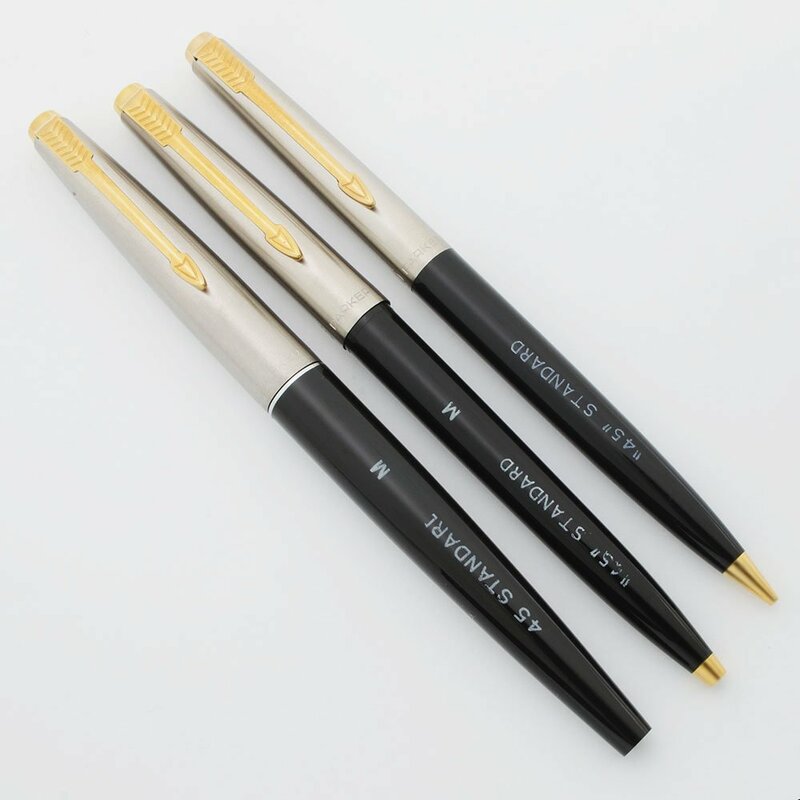 Parker 45 Flighter 3 piece Set: fountain pen, ballpoint pen, and mechanical pencil. Flighter (brushed steel) caps with gold-plated trim and black barrels. 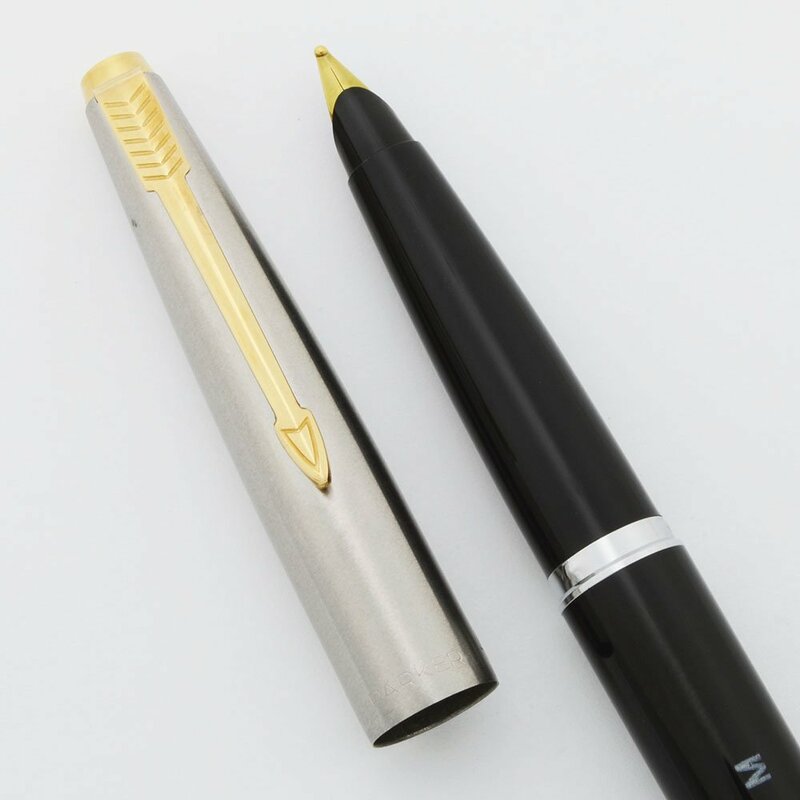 Fountain pen is fitted with a broad gold plated nib. New old stock condition with some storage marks. Color "Flighter" brushed steel caps, black barrels, with gold-plated trim. 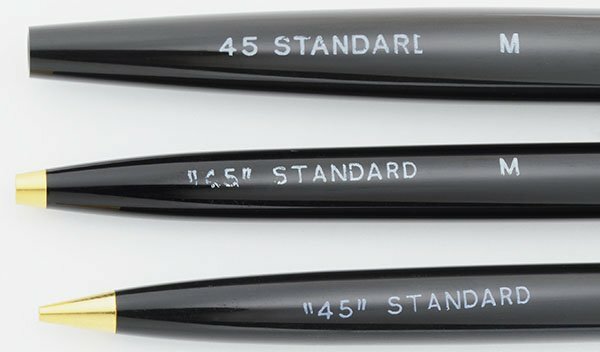 Original chalk marks are on the barrels, "45 Standard "
Nib Gold plated nib is a broad (there is a B on the nib feed), though the chalk mark on the pen indicates a M for Medium. Condition New old stock with light marks picked up in storage. All three pieces are in excellent condition The fountain pen barrel and cap look great, with just a few scratch marks to the left of the bottom of the clip. The gold clip and tassie on the pen cap are really nice, with only light scratch marks on the clip. The ballpoint barrel has some light scratching with a few clusters of scratches toward the tip, just under the cap and around the chalk marks. The cap, clip, and tassie of the ballpoint look very nice. The pencil barrel has moderate scratching. The cap, clip and tassie of the mechanical pencil are beautiful; the tip has some scartches. The three pieces make a shiny, lovely set and are all in excellent working order.